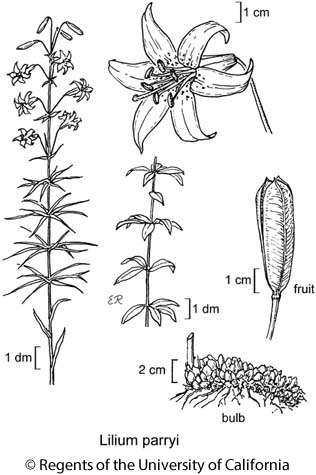 Habit: Plant < 1.9 m; bulb spreading-elongate, scales (1)2(4)-segmented, longest 0.8--2.7 cm. Leaf: in 1--5 whorls (or alternate in young plants), 7--29 cm, narrowly linear or not; margin not wavy. Inflorescence: flowers 1--31, spreading or +- nodding. Flower: generally +- bilateral, funnel-shaped, strongly fragrant; perianth parts 7.7--10.7 cm (inner wider), +- oblanceolate, recurved in distal 40%, bright yellow, maroon spots generally sparse, minute; stamens +- exceeding perianth, filaments +- parallel, anthers 8--14 mm, pale magenta-brown, pollen rusty- or brown-orange; pistil 5.3--9.3 cm. Fruit: 4--6 cm. Citation for this treatment: Mark W. Skinner 2012, Lilium parryi, in Jepson Flora Project (eds.) Jepson eFlora, http://ucjeps.berkeley.edu/eflora/eflora_display.php?tid=30952, accessed on April 19, 2019.